It's August and the juvenile's rusty brown feathers have mostly been replaced by white feathers, like those of the dazzling adults. His tawny color lets him blend in, so a predator would notice parents first. His mix of feathers tells other territorial cranes that he’s a youngster and they cut him some slack. The young cranes are starting to fly. Families and subadults fly off to forage in corn fields, meadows, wetlands and marshes. 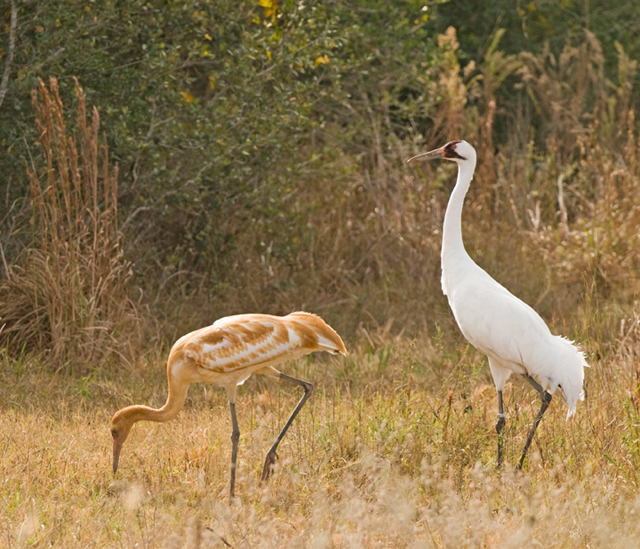 All cranes must build up body fat to fuel them on the coming migration. By the end of August, youngsters stand almost as tall as their 5-foot parents.